The Personal Capital issue that I wrote about the other day has been resolved. 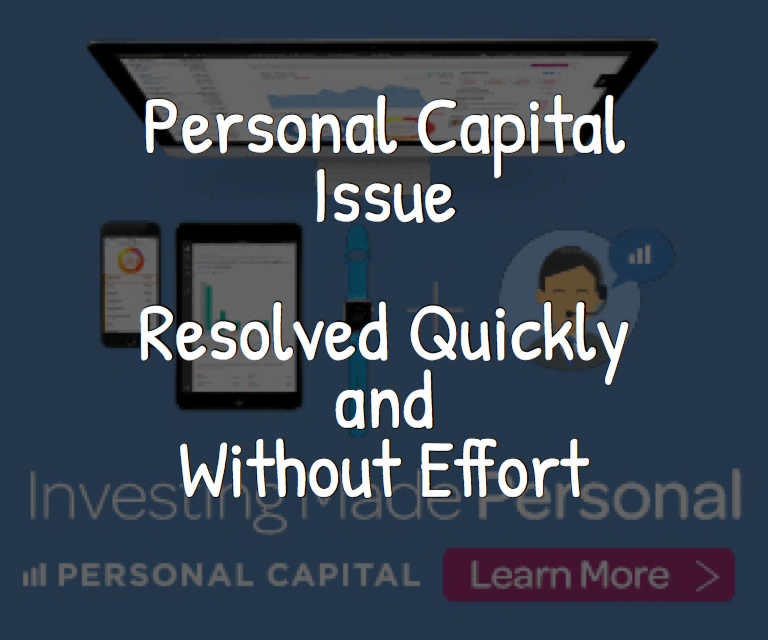 And I will say that I am impressed with the responsiveness that the Personal Capital team demonstrated. I sent an email to the support desk at 10:09 am. I received a response back 91 minutes later asking me for more specifics on the missing transactions so they could look into them further. It happens that I had outside meetings most of the day so I didn’t get a chance to respond back until later in the evening. And during that 5 hour period, I received two follow up emails letting me know that they had reviewed the account. Once I actually opened the application that night, the missing transactions had appeared and the accounts now reconciled all without my having to do anything. As I said before, I’ve been impressed with Personal Capital since I first began using their service last year. I am now an affiliate of Personal Capital, but I started using them before I had any financial relationship. In fact, the link above is my affiliate link. So if you sign up using the link, I will receive a small fee from them. This fee does not impact what you pay for the service in any way but greatly benefits me and helps keep this site up and running. The service is so easy to use that this was the first time that I needed to reach out for support. The only thing that had ever bothered me before was that initially, I don’t believe you could export reports or even your transaction history. And as much as I love and use the online dashboard, as an analyst, I still like to download my data, put it into an Excel pivot table, and look for trends, patterns, and anomalies. I’m not sure if it was my lack of product knowledge or if they have since made an upgrade, but I’m happy to say that the application does now support exporting your transactions (at least from the Chrome browser). Actually, this is how I came across the issue yesterday. With a prior personal finance software product a few years ago, I ran into a problem where I had neglected to link a new credit card. This situation went on for a number of months before I realized what was going on. And it led to quite a few missing transactions and understating my expenses during that time. I learned my lesson. So now I don’t just look at my expenses and cash flow, but I also reconcile the balances back to my bank statement. This check ensures that I’m capturing all the cash outflows. If you’re not yet a customer of Personal Capital, I recommend you give it a try. The service is free to use. The only time you pay is if you opt to use Personal Capital’s investment advisory service. But because I personally manage my own investment portfolio, I do not use that service. I will say that one of the big reasons that I felt comfortable managing my own investments is because of the information available in Personal Capital. I can see my allocation by asset class and by sector, the fees I’m paying, and the performance of each account. All this information is available free of charge. So again, click here to give Personal Capital a try. And let me know what you think. Readers, if you’re not yet using Personal Capital to track your expenses and investments, is there a reason why? Remember, what gets measured gets managed. The first step toward financial independence is knowing what you have.